A couple of posts ago, I had talked about how Yahoo is working on its social media strategy. Its two applications – Yahoo Buzz and Yahoo Pulse are creating quite a buzz in the market as has been shown by the recent Comscore Report. Taking the theory of innovation and changes in mind shift forward, Yahoo is working to re–strategize its entire search process. With its deal with Bing, it seemed as though Yahoo had given up on its search competency. But this could change with their recently announced strategy. 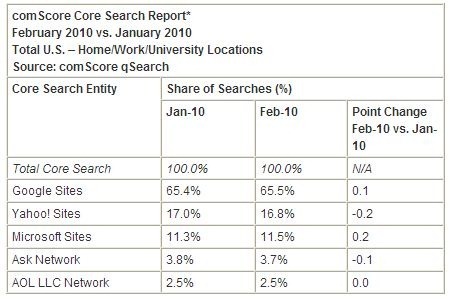 As is shown by the recent Comscore Report, the share of search on Yahoo is way less than Google (65.5%) at meager 16.8% and this also has seen a drop of 0.2%. Other than this, Yahoo also has gesture–based search, voice–based search in the plans currently. Is this move going to be successful for Yahoo Search? Can it bring Yahoo Search to the forefront? To state it bluntly, Yahoo is really far down the pecking order when compared to Google. These initiatives although new for Yahoo are already present in some form or the other in Google. Yahoo also seems to be a laggard or the second best when compared to Google in terms of innovations in search and that is one of their biggest disadvantages . This move shows that Yahoo still has some firepower left to innovate in its search business despite the fact that Bing is the one powering it. It has also raised the hopes of the field of ‘search’ seeing competition in the near future and made it really interesting. Do you think Google would be the sole player in search for years to come or would another organization replace it on the pecking order? yeah definitely because yahoo is the most commonly used site by the users and hence everyone will like to feel some new features. i found that some new thoughts are very interesting.